Are you being served by Mr Humphries? Date of birth: Too shy to tell? Qualified as referee: 1988 and then by 1994 had passed all necessary exams. First Pro match: It was a Challenge Tour game in Altrincham about 1996. Ken Owers was one of the players. Most memorable match: Got to be Stephen Hendry against Nigel Bond at 2006 World Championship. 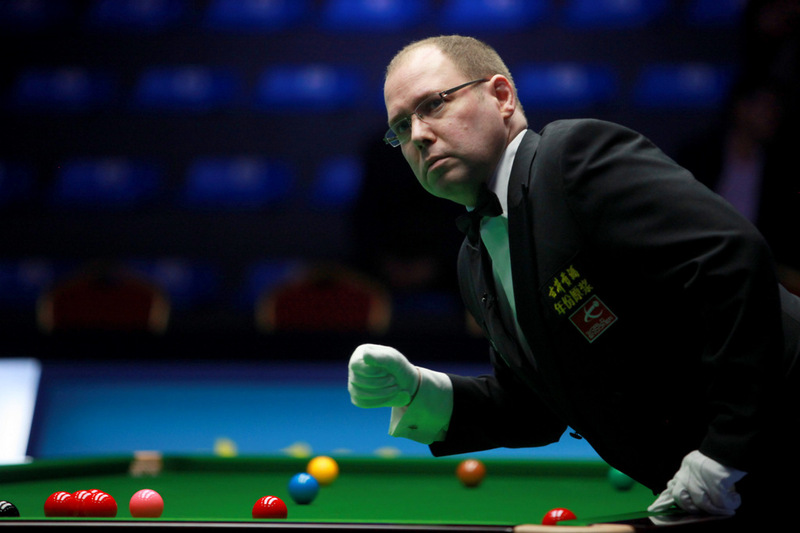 It was only my second match at the Crucible and what a finish – it went to a respotted black in the last frame! Probably not Stephen’s most memorable game. Most embarrassing moment: I refereed Ronnie O’Sullivan a few years ago at the Crucible. He potted the black, but stuck it in the top of the pocket. I went to pick up the ball from the rail and placed it on the black spot, but it was a red instead. If you weren’t a referee what would you do: I live on and own a farm with my brothers and sister so I probably have the best of both worlds. Which is toughest rule to apply: Like most of my colleagues, I’d say the simultaneous hit. Unless you’ve got the benefit of a slow motion replay, it can be almost impossible to spot. What do you carry in your pockets: Two pound coin and ball markers. Generally though as little as possible. Don’t want my pockets to rattle!. Where do you get your gloves: Usually from Slaters and sometimes from China when we can get a supply of them. Interests: Staunch Everton fan. I also enjoy playing billiards/snooker in my local league. I enjoy gardening and looking after my farm animals.